In autumn the lacewings make themselves noticeable. 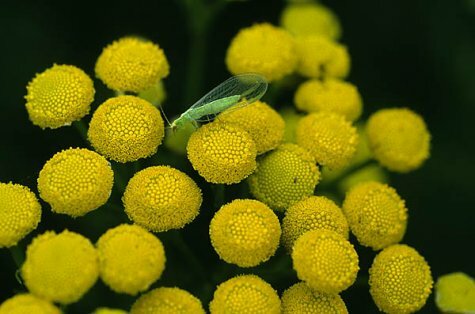 The lacewings have their English name from the „lacy“ wings, the Estonian – kiilassilm – from their greenish-golden eyes. In summer we saw them flittering around trees and shrubs, as the evening darkness lengthened circling in the lamp light. In Estonia some ten species of Chrysoperla are known, the most common being C. perla and C. carnea. As larvae they are very useful insect and aphid “lions“ that destroy aphids in large numbers. The imagos feed on plant nectar and pollen; two or three generations develop during a summer. For winter they slip into buildings, unheated summer houses, beehives, sometimes in great numbers. From summer we remember these insects as green, now they have faded to a greyish colour. In spring the green pigment returns as the day length increases. You can safely let greenflies stay in your rooms for winter, they will not harm anyone or anything.